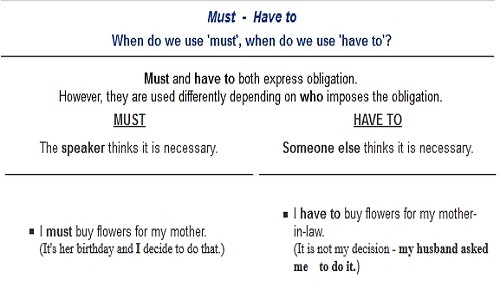 “Have to” and “must” are very similar in meaning and can often times be used interchangeably. You can say: “She must go to the store” and “She has to go to the store.” The meanings here are the same. As such, many people use them in this way with no distinction. There are some differences that need to be noted, however, to use them properly. “Must” is an example of a modal verb. Here are some examples of other modal verbs: can, could, shall, should, ought to, will, would, and might. They are used to with other verbs to express ideas like possibility and necessity. It should be noted that “have to” functions as a verb. “Have to” can also be used with “to do with” to mean to deal with or concern something. For example: “What does this movie have to do with that book?” This shows that the movie and the play may or may not be related based on the context. On the other hand, “must” is used to convey a stronger meaning than simply “have to”, it’s more forceful. “You must be here by 1:00pm.” In this sentence, the use of “must” gives more import to the need to be here by 1:00pm. However, it can also be used to show that something is logically the result of something else. For example, “The dog is barking, someone must be at the door.” Here we see that because the dog is barking, the logical conclusion to draw is that someone is at the door. “Must” can also be used to emphasize a statement. For example: “I must say, this is an excellent meal” or “I must warn you, it’s dangerous in that part of town”. “Must” can also be used to express annoyance at some action, used primarily in American English. For example: “Must you play your music so loudly?” “Must” can also be combined with certain adjectives or nouns to denote things that are highly recommended as well. For example “That’s a must-see movie.” This cannot be done with the word “have”. It should be noted that there is a difference in the negative forms. “Must not” is used much like a command, for example: “You must not smoke in here.” It’s letting you know that it is not permitted to smoke in here and that it is prohibited. But “not have to” isn’t quite as strong or limiting. For example, “You don’t have to pick me up at exactly 5:00.” This indicates that the individual is not required to pick the person up exactly at 5:00 but they can if they choose to. While “must” and “have to” can often be used interchangeably, there are marked differences between the two. Knowing how they are used will give you more variety in speaking and writing in English. It will make your English much richer and full of meaning. Aaron Hutchinson. "Difference Between “Have To” and Must”." DifferenceBetween.net. June 8, 2016 < http://www.differencebetween.net/language/difference-between-have-to-and-must/ >.